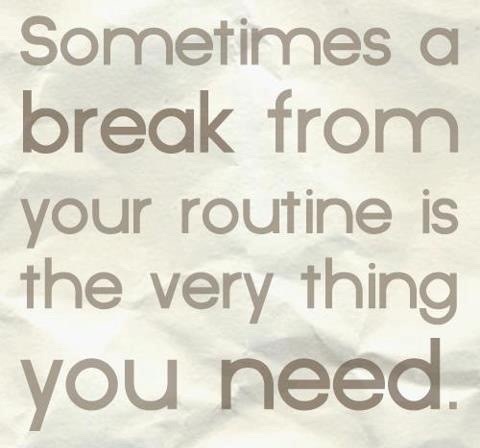 A break from your routine is the very thing you need. Since I got back from my holiday I've been really struggling to get my act together. I just can't get into the swing of things at all. I've been back a week and a half and I'm sure most people struggle to some degree to get back on that daily treadmill, but this time I'm finding it even harder and I'm not sure why? I can't be arsed to go the gym, I'm eating and drinking for England, that should have stopped when the holiday finished, and I can't seem to find any motivation at all, for anything. I should have done at least a couple of posts by now but my creative juices just aren't flowing and I keep beating myself up about it. I go to bed telling myself that tomorrow will be the day I get my act together and have a productive day, I have all these plans in my head and think I'll be bursting with positivity the next morning, I'm still waiting for it to happen however. What's behind it all? I know I'm really tired, that's probably down to my RA, I'm currently in a lot of pain so I know that doesn't help, and I don't think going on holiday later in the year helps either. I do love going in September but when you come back the nights are drawing in, especially with the rainy days and when it's wet, miserable and dark it doesn't help my mood, in fact my mind is constantly drifting to sun, sea and cocktails rather than thinking about the next thing I can photograph. Today, I got up a bit later than usual, mooched around a bit, 'thought' about sitting at my computer to write, but ended up doing the ironing instead whilst catching up on episodes of Holby City and drooling over pictures of London fashion week on Insta. Although today I had a positive thought and promised myself I WILL somehow get to the next LFW. The rest of the day was spent on the sofa, munching on crisps and all sorts of other rubbish that was in no way shape or form going to make me feel good about myself but I couldn't help it! I spent some time on that sofa catching up on the hours of TV I have stored on the Tivo box and came to the realisation that it's ok to sit down and do nothing. Absolutely nothing. I'm not very good at doing nothing and Mr C is always telling me so. But then I got to thinking that surely it's actually ok to take a break from your daily routine, not just from the everyday things but to take a little break from the blog too. I bet lots of other do. I'm trying hard to build my blog and I do worry that if I'm not pro-active all the time, and posting on Instagram every five minutes then no-one will be interested. Then the other half of my brain is saying that no-one will miss me anyway so what am I worrying about? 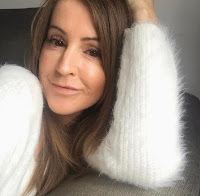 That's the negative missy in me kicking in, and that's another thing going on in my head since I've been back, I've been asking myself the question that occasionally rears it's ugly head, "Am I too old to be doing this blogging malarky?" and "who am I kidding, why would anyone be interested in what I have to say, it's a young un's game". I guess these thoughts come along when I'm tired, run down, lacking inspiration and unable to find any motivation whatsoever. Damn you holiday blues! I know I'll get my mojo back, I just hope it hurry's up! I need to stop eating junk, that also may be part of the reason for tiredness and lack of energy, I need to get back to the gym and I need to blog. BUT I made a decision today, you see slobbing out on the sofa most of the day wasn't wasted, and it's that I'm not going to worry about it too much and pile huge amounts of pressure on myself. We all need a bit of a break right? I'm sure lots of people go through a blogging slump, don't they? Mr C is away tonight so he's not here to give me the usual kick up the arse, boost my blogging confidence and make me smile. I suppose it's a start that I'm writing this post as this just started out being a quick note to say I'm back from my hols and sorry for the delay with posting, but several paragraphs later and it resembles some kind of a post, I think. The above quote is spot on and I'll be honest and say that blogging, and everything that goes with it has not been at the forefront of my mind just lately. It does make me sad when I think about that as I worry I won't get that excitement back but sometimes a break from your routine, be it long or short, is exactly what you need to refocus and we should definitely listen to our bodies more and rest if we need it, I'm a fine one to talk though, I just can't sit down! Hopefully before long I will be churning out the posts, crossing things off my to do list like there's no tomorrow, be back at the gym and be full of energy. Do you have days where you just can't be bothered? What do you do to get yourself back on track?